The northern Laos loop takes us through a clockwise route from Vientiane to Xayaboury (also Sayabouli or Sainyabuli), followed by Luang Prabang, Nong Khiaw, Xam Neua (also Sam Neua), Phonsavan and Vang Vieng before bringing us back to Vientiane. For this loop, it is best to plan at least ten days in order to ride at a reasonable pace and have adequate time for sightseeing. Depending on your interests, adding Hongsa (they have an elephant festival every year), Oudom Xai or Phongsali to the trip are possible. After all, this is the flexibility we enjoy by not taking a tour and having our own transport. Personally, I spent eight days for the 1700km loop. I had a pretty rushed trip and except for Vientiane, I did not spend more than a night at any other cities or towns. I wished I had spared more time for Phonsavan. The main highways such as route 13 (Luang Prabang to Vientiane) and 7 (Phonsavan to Luang Prabang) are in excellent conditions. The twisty tarmac roads are a joy for riders. However, expect dirt and gravels at the smaller roads such as route 4 (Xayaboury). 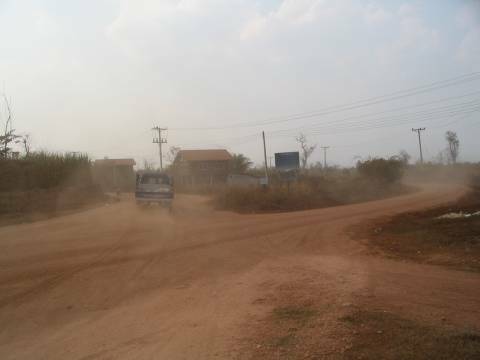 As I was there during the dry season, it was quite dusty. Maybe it would be wise to bring along a face mask. 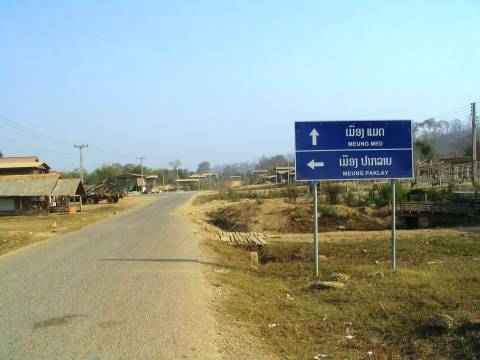 The road directions in Laos are similar to Cambodia and Vietnam. You would be able to find road signs at major junctions. The helpful kilometers stones we have grown to love can also be found at most roads. Even with these aids and a good map, some tourist spots such as the Suan Hin (Sao Hin Tang) might not be easy to find. At such times, your best hope is the locals. Kilometer stones tell you the distance to the next major town or city. Notice our fellow road users in the photo? Sometimes they hog the lane and you cannot do much about it. Even though I brought my Garmin GPS receiver along, the memory card was dislodged after day 2 and I didn’t discover it until the end of the trip. So I only have a portion of the route. Luckily, my waypoints (including Plain of Jars and Suan Hin locations) were saved in the internal memory. If you would like a copy of the files, just post a comment and I will send the download link to your email. The file size is around 0.94MB. This entry was posted in Laos, Motorcycle Adventure Vacations and tagged Adventure travel, download, gps, Laos, Motorcycle, roads, route, tracks, waypoints by atticus. Bookmark the permalink. OK, I’m interested in these waypoints too. Hi I’m interested in the waypoints and the route too. Lao’s wet season starts around May. So best to start earlier if possible. Or else keep to better roads. If you are starting from Vientiane, I would suggest skipping Xayaboury (as opposed to what I have done) and heading up route 13 directly. After a northern loop (visit Vang Vieng, Luang Prabang, Xam Neua etc), head south along route 13 (visit Pakse, 4000 islands etc). You would need to arrange for the bike to be returned in the south so you need not ride back to Vientiane. Move on to Cambodia from Southern Laos. You can get more suggestions at gt-rider.com forums. 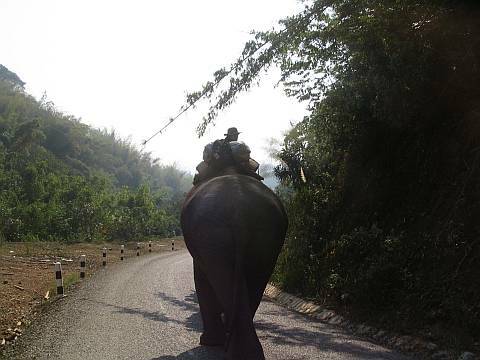 I am currently riding through northern Laos and would love a copy of your waypoints as well! Thanks for your notes – looks like an amazing trip. We’d like to emulate it although coming from further north via vietnam. We would love a copy of the GPS route / waypoints. Link sent and nice blog! Im in Vietnam, and just got a bike to go to Laos. Its my first time riding, and Im a bit concerned about this higly montanious and difficult roads. All these tales about rocks in the road and lots of courves are driving me crazy! 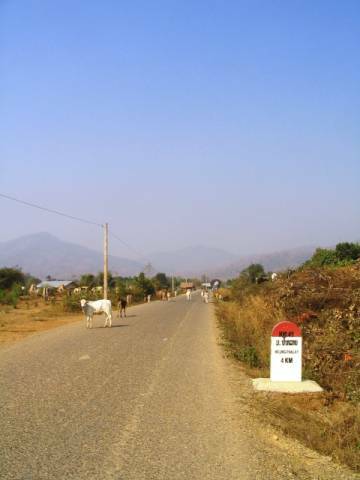 Im entering the country through Na Meo, and will head to Luang Prabang through route 6. Can you tell me if it is ok, and maybe some advices…? If you know some good online map please let me know, cause in the google earth the route 6, for example, is not properly marked. First time riding a motorcycle? Then, it is really advisable to get more practice. It’s not easy for new riders to focus on so many things while riding especially on winding and narrow roads. 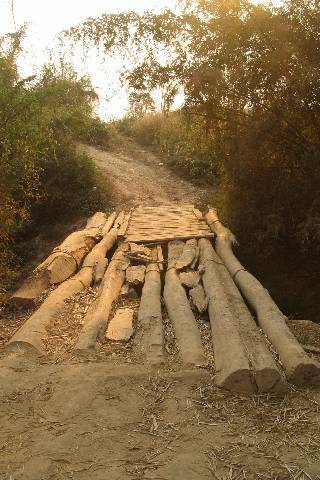 I have not traveled on the road from Na Meo to Xam Neua. But I had met tourists coming in on buses so I supposed the roads are okay. From Xam Neua to Luang Prabang, you can go either via Phonsavan or Nam Bak. Both routes have the usual twists and turns. GT-Rider produces a very good map of Laos. Perhaps you can ask them where you can buy it in Vietnam or even ask them to ship to you. 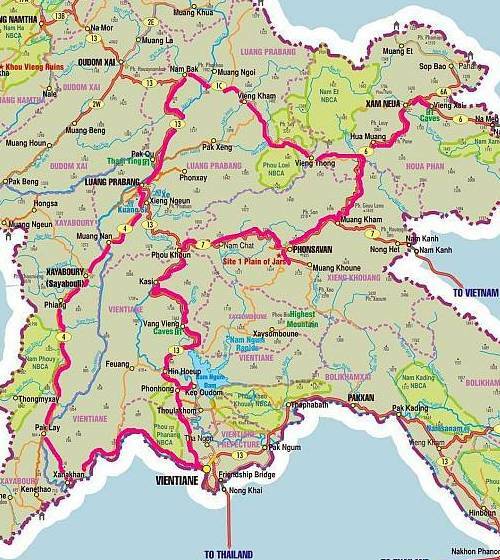 we want to do motorcycle trip in norterrn Laos this october. Could you please send me you gpx track of your loop for further detailed planning? ?